The incredible story of the life and phenomenal career of hockey's most legendary superstar, told through never-before-seen photographs. Bobby Orr rarely speaks of his accomplishments as a hockey player. He doesn’t have to—his play did all his talking for him during his storied career. His was a style of seemingly effortless grace, a style that helped reinvent the sport of hockey. 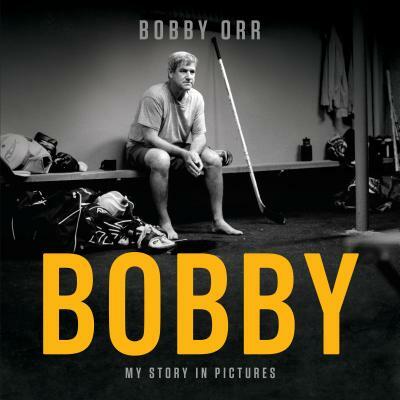 Now, Bobby Orr shares his story through a personal collection of photos, inviting readers into different seasons of his life while introducing some of the people that filled these moments in time. We see him at home and in the dressing room. We are there the day the Boston Bruins first scouted him, at rinkside when he celebrated his first Stanley Cup with his father, and back in Boston the day his famous number four was retired. Yet behind all the statistics, trophies, and public persona, is the man himself. There were losses to go along with the victories, disappointments alongside the accomplishments. Without the people around him, and without the many challenges he faced along the way, the triumphs would have meant much less. Capturing not only a legendary career and incredible person, Bobby: My Story in Pictures also brings into focus a different era. These photos chronicle not only the changing of the game, but also mark many significant milestones of his life. Personal, thoughtful, and full of never-before-seen images of Bobby Orr and those close to him, Bobby shows the varied sides of a player who rewrote the record book. It is a public journey into a world of a very private man. BOBBY ORR, born in Parry Sound, Ontario, in 1948, played for the Boston Bruins from 1966 through 1976, and helped lead the Bruins to the Stanley Cup championship in 1970 and 1972, and to the finals in 1974. He also played two years for the Chicago Blackhawks. He is widely regarded as one of the greatest hockey players--maybe the greatest hockey player--of all time. His speed, scoring, and playmaking abilities revolutionized the position of defenseman. As of this date, he remains the only defenseman to have won the Art Ross Trophy league scoring title--twice--and still holds the record for most points and assists at that position. After his retirement in 1978, Orr was active with business and charitable works, and in 1996, Orr entered the player agent business, and today is president of the Orr Hockey Group agency. He has been invested with the Order of Canada and the Queen Elizabeth II Diamond Jubilee Medal, and in 2010 was one of eight athletes who bore the Olympic flag out during the opening ceremonies of the Vancouver Olympics. The Bobby Orr Hall of Fame is in Parry Sound, Ontario.